Since we moved to Nashville, I have enjoyed the creamy sweetness of this root vegetable in a variety of presentations; classic casseroles, the more common fries, or my favorite sweet potato biscuits. I’ve never cooked sweet potatoes myself, so I got excited when I ran across a contest for best original recipe using sweet potatoes as the key ingredient. Sweet potatoes are extremely versatile and seem to go well with a variety of flavors. No wonder they have become an important part of so many world cuisines, from their home in South America to Africa and all across Asia. I was also very pleased to learn that sweet potatoes are not only rich on Vitamin A, but are, overall, one of the most nutritious vegetables. So, inspired by their beautiful color and delicious texture, I decided to create my own take on this tuberous kind. Although sweet potatoes have never really conquered Europe, I thought that their subtle sweetness would go really well with the very European buttery leeks and savory feta. And the North African-inspired ginger yogurt sauce added a touch of tangy freshness for a complete sensory delight. I think these cakes turned out quite well. Let me know what you think. To make sauce, mix all ingredients and let refrigerate. Wash and boil potatoes with skins until just slightly tender, but not too soft, about 15 min. Let cool. Heat ½ tablespoon olive in a medium pan over medium-high. Turn the heat down, add leeks, sauté until just softened. Do not overcook. Beat eggs with a pinch of black pepper and a pinch of salt. Set aside. When potatoes are cool, peel and grate them. In a large bowl, mix grated potatoes with sautéed leeks. Add chopped rosemary and cayenne. Stir in crumbled feta cheese. Season with salt and pepper. Fold in beaten eggs. Add 1 tablespoon breadcrumbs to keep the consistency of the mixture dryer and easier to handle (if necessary add more). Mix well. With hands form burger-like cakes from mixture. Coat cakes generously with breadcrumbs. In a large frying pan, heat remaining olive oil on high heat. Depending on the size of your pan, you may need more or less oil. There needs to be sufficient oil for the cakes to fry in, at least covering one-third of the height of the cake. Once oil is hot add cakes and turn the heat down to medium-low. The initial high heat will seal the outside of the cakes. Turning the heat down will ensure they don’t burn and cook well throughout. Fry 4-6 minutes on each side, until golden brown. Serve cakes with simple green salad and yogurt sauce. 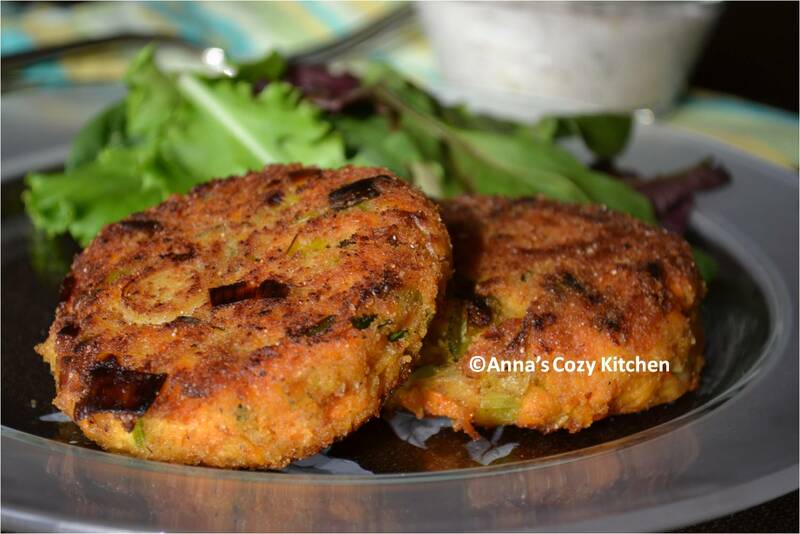 This entry was posted in Appetizers, Main Dishes, Vegetarian and tagged Cakes, Cayenne, Feta, Leeks, Recipe, Rosemary, Sweet Potatoes, Vegetarian. Bookmark the permalink. Made these last night. Yummy. Heading to Nashville in a few weeks. Can you suggest good, local restaurant with southern food? Marisa, thank you for your comment. I sent you a note back a few days ago but replying here to make sure you got it. Glad you liked the cakes. As for Nashville restaurants, there is a huge variety. There are a lot of very traditional, low key, Southern places called “meat and three” for meat and three sides. There are also a lot of newer, higher end, places that cook with southern ingrediencts and inspiration but very modern recipes. I’ll let you explore on your own. The two “must-visit” places that are local institutions in my opinion are Monell’s (http://www.monellstn.com/n-rest.html) and The Loveless Cafe (http://www.lovelesscafe.com/). Monell’s is famous for its fried chicken and communal tables. Plates are passed around the table and refilled once empty. It is a unique experience. You can get the chicken even for breakfast. The Loveless Cafe is known for the best biscuits in the South. I personally love their homemade blueberry jam. It is definately best for breakfast. Thank you! Heading down tomorrow!